The antioxidant properties of green tea have been well known for some time. Now, new evidence shows the active ingredient - catechin - may also have a beneficial effect on metabolism. Researchers conducted a series of studies and found that green tea drinkers lost more weight than those who didn't, suggesting that catechins may improve fat oxidation and thermogenesis, your body's production of energy, or heat, from digestion. 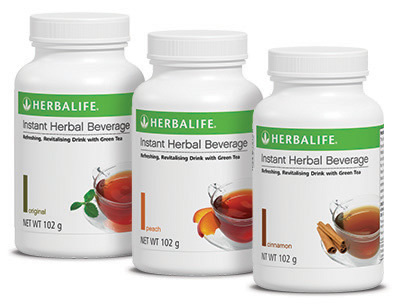 Herbalife's Instant Herbal Beverage is a delicious and refreshing green tea mix, which can be served either hot or cold. Just mix 1/4 to 1/2 teaspoon of the powder with hot or cold water and stir. It's now available in three flavours - original (lemon), peach and cinnamon. The peach and cinnamon flavoured teas are sweetened with a small amount of Stevia. The original flavour contains no sweetener, but is the most popular of the three flavours. Well-researched and shown to be rich in polyphenol antioxidant nutrients; contributes to a general feeling of well-being. Green Tea contains caffeine, generally tea contains one third less caffeine per cup than coffee. A medium-grade black tea consisting of many whole tea leaves composed purely of new flushes. Comes from the ginger family of plants. Widely used to treat digestive disorders in traditional medicine. Also known as malllow, this gentle herb is often used in herbal teas to hydrate and soothe the digestive system. Studies have shown that drinking hibiscus tea can lower high blood pressure and reduce high cholesterol levels. A natural, non-chemical sweetener which adds a slight level of sweetness. Assists in short term boosting of the metabolism.